Your wedding day is one of the most important days in your life, so it is only natural that you'll want to put a lot of energy and attention into making sure that every detail is just right. Of course, the centerpiece of the entire day will be your dress, and knowing that literally hundreds of photos will be taken of it means you'll want to be confident that it's presenting a truly memorable image of you. While it is traditional to include a head piece to complete the overall presentation of the dress, it certainly isn't required that this accompaniment be traditional. Remember, this is your day, and everything about it should reflect the uniqueness of you that put that sparkle in his eye in the first place. The first thing to remember is that when deciding on which head piece you'll wear, start with the dress. Fashion experts agree that while the head piece doesn't have to exactly match your dress, it is important that it at least compliment the ensemble. Generally speaking, whatever the type of design you've chosen for the front of the skirt, or the train, is incorporated into the back of the veil to give you a nice finished look. Many beautiful gowns are being seen these days with some lovely hand embroideries of various designs and colors that work nicely to accentuate the design you've chosen. Deciding on the length of your veil is the next step in the process, and most wedding designers feel that brides should make this decision based on their height. A general rule of thumb here is that - unless you're leaning toward a short neck length veil - the longer the bridal veil is, the slimmer and leaner will be the silhouette of the bride. Wearing a bridal veil that extends past the hips is the most common recommendation in this regard, as anything sitting on the hips tends to shorten and widen your look. Many women feel that the moment they first truly feel like a bride is the instant they put on their veil. And since it's such compelling symbol of this special day, many women are opting to choose bridal veils with flowers as a way to give this special compliment a subtle, yet dazzling finishing touch. A frequently choice of many brides is a simple, small pouf veil worn on the back of the head. Adding a silk flower often brings an added sense of fullness and creates a lovely overall impression. A few traditional varieties have incorporated rhinestones, and even a feather or two in-order to arrive at an absolutely elegant look. Over the last few years, a number of full length bridal veils with flowers have started to be seen that are wonderfully striking. The veil can be thought of as your pallet, to which you can apply the full range of your creativity to give yours a totally custom look for your big day. 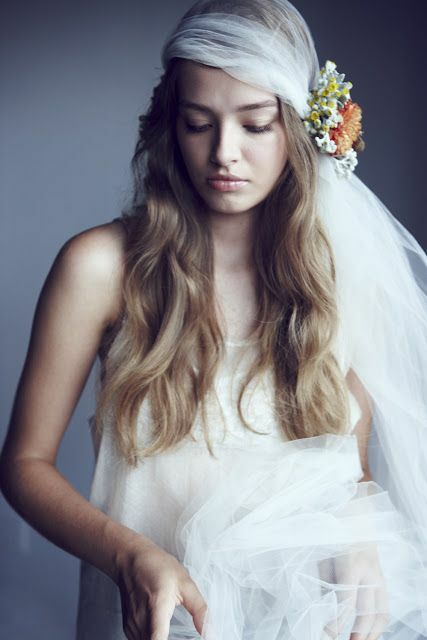 Small pastel flowers along the trailing edge is a lovely touch, and interspersing small silk flower buds throughout the full veil length delivers a soft and dreamy affect that is hard to match. The beauty of bridal veils with flowers is that you suddenly have a whole world of color and style to bring into your look that gives you a limitless number of options for completing the special look you want on this most special of days. All in all, bridal veils with flowers give your head piece a lovely and captivating finishing touch that will be remembered.